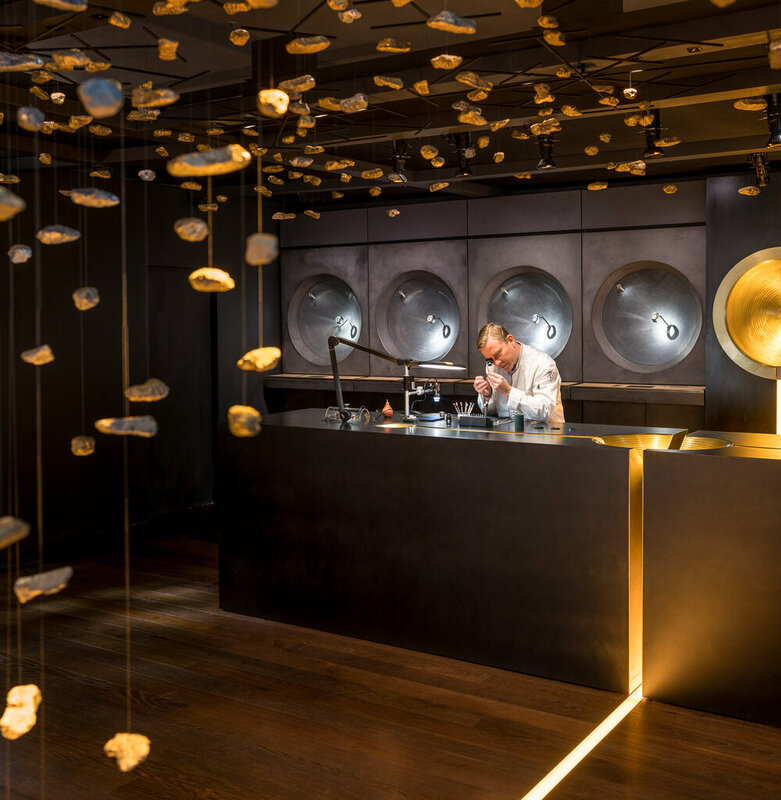 At Hong Kong’s 2018 Art Basel, Swiss watchmaker Audemars Piguet presented another innovative concept in the Collectors lounge. Chilean artist and designer Sebastian Errazuriz presented the last in a trilogy of installations. Titled “Foundations”, Errazuriz’s immersive design for 2018 is based on iron ore, the natural resource at the heart of steel and one of the principal resources for watchmakers. Italian artist Quayola’s new photographic series, titled “Remains: Vallée de Joux” unifies the natural roots of Audemars Piguet with his own visual artistry. Together, the two artists transformed the space into a somewhat fantastical hideaway with their respective creations, which further serve as the backdrop for Audemars Piguet’s highly trained watchmakers to demonstrate their craft. French artist and designer Mathieu Lehanneur was appointed to conceive a special installation that is made of 12 rooms, forming a large ring – an allusion to a watch dial. In the middle of the circle stands a huge rock, created from cast replicas of those found in Audemars Piguet’s home in the Vallée de Joux. Around it, twelve doors will open, each revealing a story about Audemars Piguet: from its origins to the 21st century, from watchmaking to contemporary art, from the Vallée de Joux to China. The themed rooms exhibit a close-up experience of the iconic swiss brand, linking the past to the present. 200 historical and contemporary timepieces are exhibited, transporting visitors on a 141 year-long journey. On display in the mirror room are rare vintage watches that have made milestones in the maison’s history. Audemars Piguet has always sought to integrate creative vision with technical mastery, as horology, artisanship and artistry have been closely intertwined for centuries. The brand is pushing a different kind of boundary, having embarked on this journey from Le Brassus to China, and is looking forward to witnessing the encounter between these two very different worlds. An expansion to the Shanghai Museum of Glass, "Keep it Glassy" displayed more than 200 works of over 50 designers from around the world. The exhibition space was designed by architecture firm Coordination Asia. Atelier I-N-D-J & CTHM architects created an urban "fountain" that flowed into the heart of Shanghai's bustling shopping epicenter, Xintiandi. Set within the Xintiandi district, a bustling lifestyle, fashion, and shopping epicenter in shanghai, china, is RIBA’s shanghai windows project. The venture partners RIBA–Royal Institute of British Architects–members with international and upcoming Chinese retailers. Working closely with their retail partner fountain restaurant, Atelier I-N-D-J teamed up with CTHM architects to create ‘fountain flow’. Light is scattered and refracted by 4mm diameter tubing–changing by day and night. Thousands of delicate, ethereal stands of light spill from the restaurants upper story towards a large fountain in the courtyard below. 30,000 meters of translucent cord refract and reflect light giving a shimmering impression that cascades across the front façade. The simple, bold installation playfully changes appearance as both natural and artificial light is caught, refracted, and reflected. The Icon and Iconoclasts by Louis Vuitton in IFS in Chengdu, China. T-Rex Revealed Exhibition was displayed in a shopping center in Tianjin, China. The installation was designed by a Hong Kong-based design firm Studio Cassells that specialises in both cultural and commercial exhibition design. Their projects range from permanent museum exhibition design to temporary exhibitions for luxury brands.